Sometimes I wish my kitchen had more features. I live in a small, but charming old apartment which means I have a charming, but tiny kitchen. So tiny, in fact, that there isn't enough space for the refrigerator. The refrigerator lives in the laundry room. Imagine that. Unforutnately, this also means my kitchen is too small for a microwave. When I want to reheat food this means business. Pulling out the pots and pans, turning on the stove, trying to reheat the food instead of recook the food. It's an art. A messy one. Which is why it would also be nice if I had a dishwasher. But I'm not even going to let myself imagine that level of luxury, not even for a second. Small kitchens leave a lot of room for improvisation. The stove is my microwave, the oven is my toaster, and the whisk is my mixer. I may not have a microwave, dishwasher, food processor, coffee maker, toaster, blender, stand mixer, or hand mixer but, damn it, I've got a waffle maker. You better believe it. 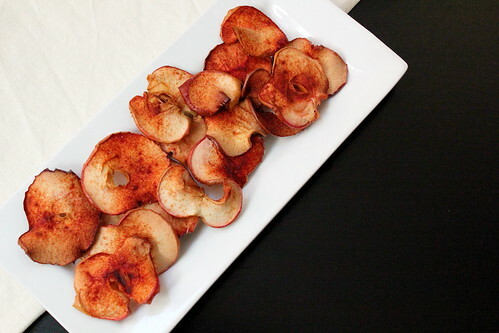 These baked apple chips are light, delicious, and perfect for snacking. 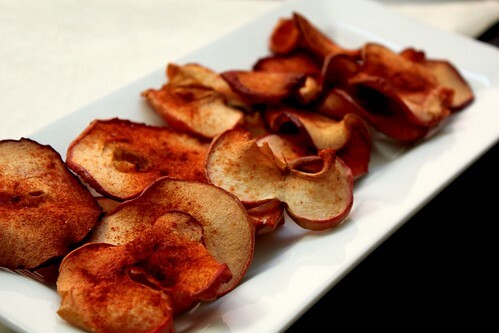 The cinnamon sugar flavor is subtle, but adds just the right amount of spice to the apple chips. 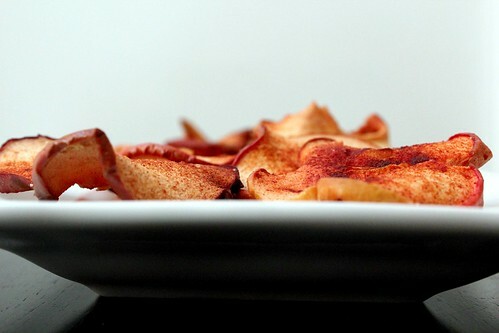 The apple chips are both chewy and crunchy, making for an interesting texture. These can be served as an appetizer, alongside a sandwich with lunch, or in the middle of the afternoon for a pick-me-up snack. And if you eat ALL of them at once? 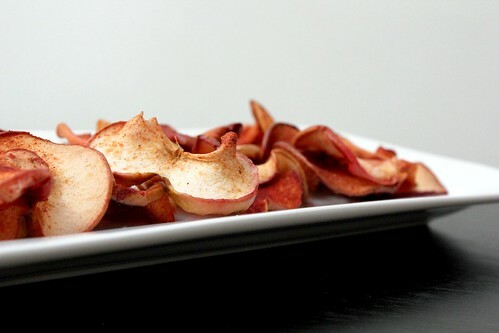 You can't feel bad about it because these are apple chips and you just got your daily recommended intake of fruit. Oh yeaaah. Slice the apples thinly, approximately 1/8 inch thick (if you have a mandolin, now is the time to use it). 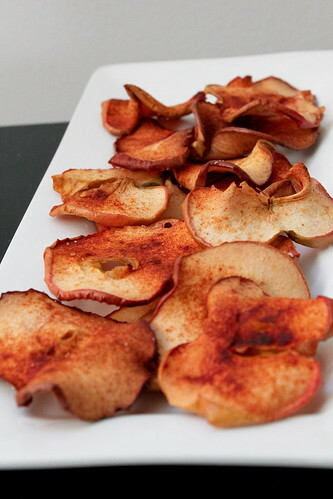 Place the apple slices into a large bowl and mix in the lemon juice to prevent the apple slices from browning. 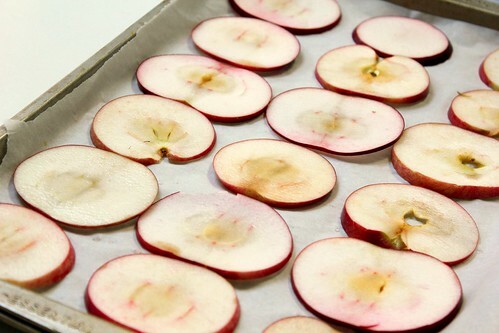 Spread the apple slices in a single layer on a parchment covered baking sheet. Try not to overlap them. You must cover your baking sheets with parchment or your apples will stick to the pan. I learned this the hard way. In a small bowl, whisk together the cinnamon and sugar. 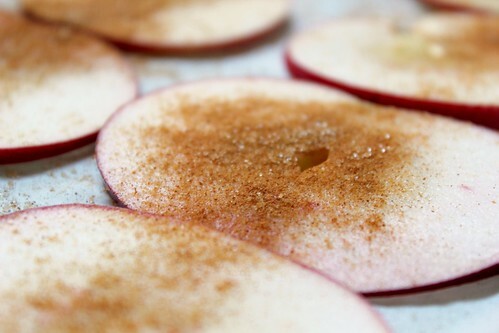 Sprinkle the cinnamon sugar mixture liberally over top of the slices. Bake in the oven for 1 1/2 to 2 hours. 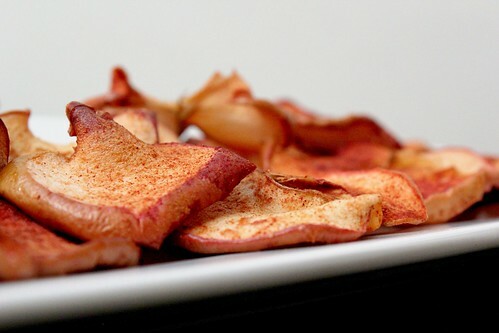 Every 30 minutes flip the apple slices over to ensure they bake evenly. You will know they are done when they are just at the point of browning. Allow the chips to cool completely on the baking sheet. Store in an airtight container at room temperature. Now munch.